And a very odd looking one at that. However, this piggy is incredibly valuable, at least to me. Although the first time I saw it I didn’t care for it much at all. Almost ten years ago (it’s amazing how quickly time ticks away) my father died after a long journey with Alzheimer’s. During the last few years of his life he lived in a nursing home and at Christmas time someone would help him ‘shop’ at a little holiday store on site to get presents for his kids. It was much like the Santa shops in elementary schools where kids bring a few bucks and buy presents for their parents and siblings. Well, one of these years Dad gave me this very piggy. An odd colored massager. Not quite the household treasure that most people are looking for. Don’t get me wrong, I wasn’t expecting anything terribly fancy, but socks or slippers would have been nice. The piggy wasn’t high on my list. But in the spirit of Christmas I said thanks and was determined to enjoy it, even if it was minimally. But then something happened that would forever change how I viewed that piggy. My brother asked for it. Please understand, this was quite surprising as most people would not view this object as a desired item. The rest of the family was also surprised when my brother requested this item. But since I was ambivalent about the gift I let him have it. I was a bit curious about his sudden taste in gaudy pigs, but ‘to each his own.’ And I went on with my Christmas-ing, never to think much of it again. After a few years of this tradition one of our relatives who lives out of town received the gift and the gift disappeared with them. I was heartbroken. This meaningless gift had become a very precious part of Christmas. Not only did a fun tradition suddenly end, it was as if another piece of Dad was gone. If you know much about Alzheimer’s, you know the journey involves losing your loved one piece by piece. To lose one more part of Dad, even if it was only a small part in the form of a gaudy piggy, was heart wrenching. But last year, December 25, 2007, to be exact, the piggy showed up. Seven years after it disappeared. There was one package under the tree labeled ‘To Matt From Santa.’ No one thought much of it until he opened it and found a very gaudy piggy massager. Now since this was only Matt’s third Christmas with the family, he had no idea why he was receiving such an odd object from my family. His only comment was, “It’s a piggy.” But the rest of us were elated and all talked at once. The piggy was back. I can’t even begin to describe my joy. This gift I had once rejected had now become, at least for me, the most coveted gift at Christmas. This gift not only is fun for our family, it always reminds me of Dad. And when I see it, I feel like Dad is still with us. I miss him more. I remember him more. All because of a piggy massager. My brother made a brilliant move, re-gifting this piggy. Otherwise I may never have known its true value. Now another year has passed and it’s time for Matt to pass on the piggy. I can tell you I’m quite reluctant to see it go. It has been wonderful this past year to see it happily resting in our home, reminding me of Dad, reminding me of happy times with family, feeling the joy all over just to see it again. As we pass on the piggy it may be several years before it returns to our home. And there’s the chance we may not see it again at all. Once again I’d be heartbroken if it disappeared, probably even more so than before. But despite those risks the piggy must move on. I don’t know if others in the family treasure this piggy as much as I do, but they might. And if they don’t yet, maybe they will one day. Now next year I will wonder with others, “Who will be next to get the piggy?” The best presents can be gaudy and beautiful at the same time. 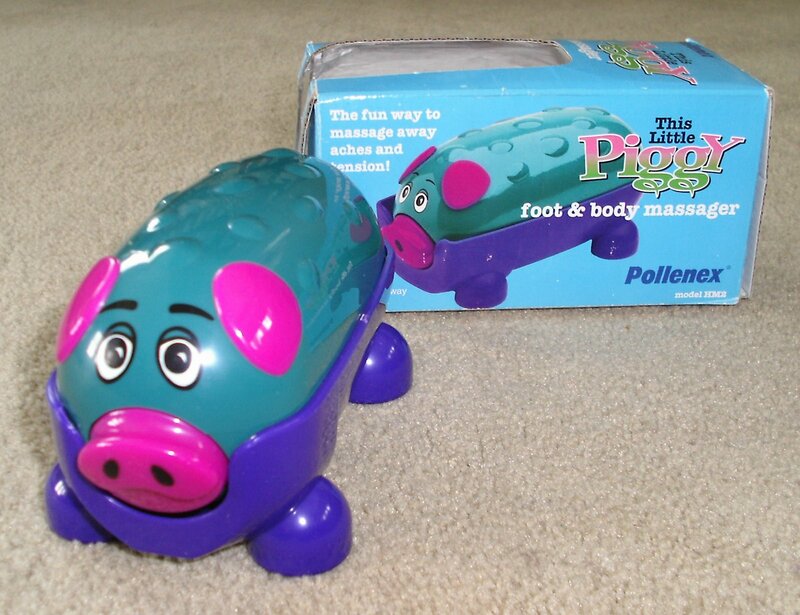 They might even come hidden as a piggy massager. Dad, I love you and miss you. Merry Christmas…may you find precious gifts in unlikely places.